Removing intake studs: as nasty as exhaust studs? I'm going to pull the trigger on a set of PMOs and will have to change out the intake studs to accomodate the insulators that go between the heads and the manifolds. Are the intake studs as hard to get out as the exhaust studs? Any experience or tips on removal would be much appreciated! they usually come out nicely. usually. Thanks John. Do you recommend the same technique for removal (heat) as the exhaust side? I did the exhuast studs about two weeks ago and managed to get away with breaking only 4. Hopefully this will go better. I changed from CIS to Webers last year on a 2.7 that had been rebuilt a LONG time ago. Double nutted all the studs and they came out very easily, no head, no penetrating oil. I did what deanp did...double nutted. No heating required...Did all studs in 1/2 hour! Trick is to keep the top nut tight against the bottom nut (allen socket in pic) while loosening from the bottom nut (box wrench). Last edited by porschett; 04-10-2006 at 07:59 PM.. He's talking about the intake manifold studs, not the head studs. Presumably switching from CIS to PMO's. Opps. Same technique with the exhaust studs except I used PB Blast and let the studs soak overnight. I just did 9 heads with the double nut technique. Best results are to tighten a bit first using the top nut to break the seat, then use the bottom nut to remove. Building molecues or building cars... you do get more of first in every batch. A mol of porsches anyone? Thanks for all of the tips guys. This makes me feel better about taking on this project. The thought of having to drill out any more studs is enough to make me run screaming from the building. If a stud requires a lot of torque to remove (or install) the double nut technique can require tightening the nuts so much that they permanently distort the male threads on the stud. 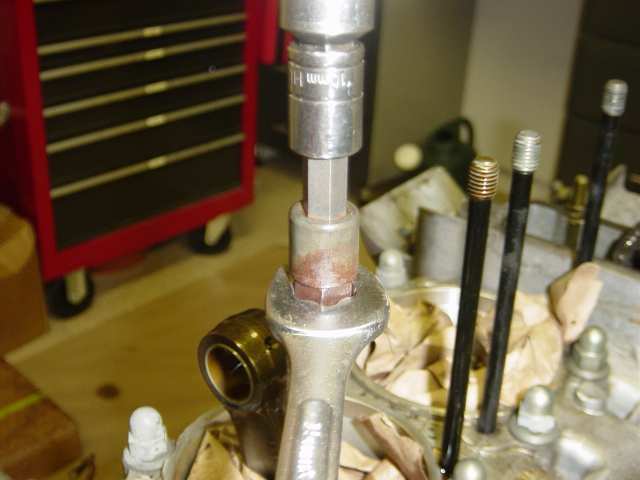 This can result in later erroneous torque wrench readings (the stud will be under tensioned) and difficulty running down nuts. This doesn't matter so much on removal if the studs are to be discarded however if the studs are to be reused or during installations one might want to use something like the Snap-On collet type stud removal/installation tool. Good application note Jim. Why didn't I mention that! I pitch(ed) all my studs as a matter of course. BTW, head down to your local bolt/nut store and have them match what you pull. I did a box of 50 for the three types of head studs (I am going to use the cool studs with the internal wrench for the exhaust and intake) for about 60 bucks. Why would you ever use a tool to install a stud? Finger tight is all they are supposed to be. On occasion I have been known to use some blue locking fluid if the nut will be removed often. The red is used for 'perminate' installations where it is likely I will never ever remove the nut or its a truly critical fastner. Some studs require a more than finger capable torque to screw in; it depends on the thread tolerance classes and depth of thread (thread friction). I have never even seen a class 4 or 5 tap. Hell I wouldn't even know where to order one! Do they even exist or are they just a spec? Ahhhh, coatings. Do you not strip the coating (or specify no coat on the threads) before you install? OTOH we had some silver plated studs for high heat and the engineer from the company that supplied them told me that the male threads are actually rolled to a different size depending on the final coating. These were NAS spec fastners, so YMMV. Thanks for some extra knowlage for the tool kit. Fastners are so kewel. Silver plated MP35N (among the best engineering alloys our civilization can make) bolts we are using in our high field magnets. 35% "out of Africa" cobalt and expensive as sin ($135 each). Silver plated to prevent galling; the usual anti-seize lubricants can be washed out by our liquid nitrogen coolant and plate out elsewhere compromising the high voltage insulation. Threads were undersized to compensate for the silver plating. Mmmmm... fastner prOn! That is a nice looking piece. That's a price for a bolt, but you get what you pay for. You got me beat by a mile! 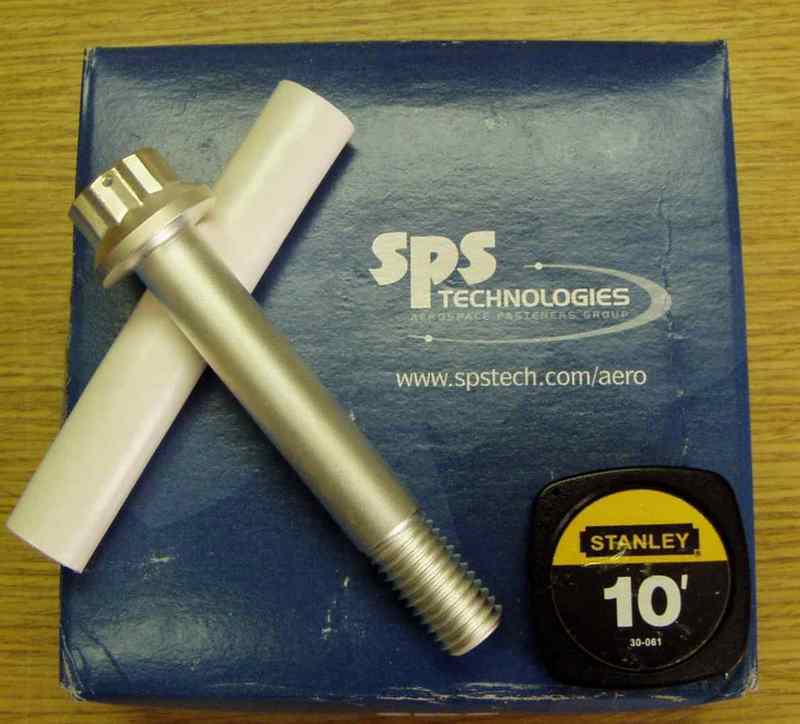 SPS makes some mighty fine bolts. 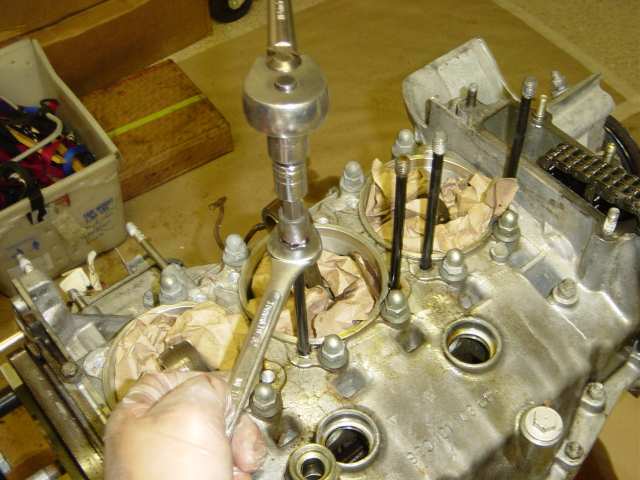 I am constantly amazed at how much thought and work goes into a bolt (to be done correctly). I am actually kind of suprised that the bolt isn't waisted. The higher strength alloys don't like fretting (or is that for a shear application)? Can I get head studs like that? Tensile loading; but the shank is in a clearance hole and threads engage a tapped blind hole in Nitronic-40 (nitrogen strengthened manganese stainless steel - "high falutin" 304). Last edited by Jim Sims; 04-11-2006 at 08:34 PM..